After my recent Utopian calendar post, let's follow-up with something more practical. What date does 10/11/12 denote? 10. Nov. 2012? Or 11. Oct. 2012? Or maybe even 2010-Nov-12 or even more surprising 2010-Dec-11? In the USA, the second guess is probably most plausible. In Germany, France, and countries nearby, on the other hand, such a question would be quite unlikely to arise, because the slash (/) is not usually used to delimit dates. This is a very good thing, because if someone writes a day in their country's most common format, this allows us to also guess the intended order of numbers and thus the meaning. If I see 05.04.80 I assume German syntax and semantics and read it as a day in April. Given this convenient feature of syntax, I find it very disturbing that some programs offer to format dates using American slashes for separation but a non-American Day/Month ordering. It seems like they tried to adapt to a different cultures, but did it so half-baken that they only made things worse. To make things simple again, I am using a few very easy rules to make all my dates unambiguous, no matter in which country I happen to stay, who is addressed by my writings, and which format I am following (my own or the recipient's, if they are different). Rule One: Always use different syntax for different ordering. Rule One Prime: Avoid / since it has been abused to much. Better use . when starting with the day or use - when writing in ISO-format. This first rule already removes most of ambiguity, but it doesn't it always make very intuitive to read dates. For example, it's easy for me to process "1. March" and just as easy to read "March 1st" or "Mar-01", but there seems to be something wrong about March 1st 2013. Therefore Rule Two: always write a date with increasing order of "day. month. year" or completely decreasing order "year-month-day". So I can choose to write 1. March 2013 or 2013-Mar-01, but not any other order. Note that this scales well for incomplete dates such as "March 2013" (or "2013-Mar") as well as date-time combinations such as 13:45 on 13.Mar.2013 or 2013-03-13T13:45. Finally Rule Three: although the above is quite unambiguous already, whenever I am in an ambiguous context such as a country with a different convention from mine, I also prefer to spell out years with all four digits and spell out months with at least three letters. The latter might seem a little antique or overly literary for a person who likes numbers a lot. But I think that words just are more helpful here. Do you still remember the age before smartphones? Then you might also remember those tiny credit-card-sized calendars like the one shown to the right. You can't write almost anything on those and they can't remind you of things. The only purpose they have is to tell which day of each month is which week-day and when public holidays are, because unfortunately, this changes every year, so it's really hard to remember. Maybe you've ever asked yourself why this has to be so complicated: why can't it be the same every year? In the Gregorian calendar, each month has between 28 and 31 days, which makes between 20 and 23 working days which is not only being complicated by a different number of weekends per each month every year, but additionally by public holidays which may or may not fall on weekends. In Germany, for example, depending on the year and the date of Easter, May might have 3 public holidays. 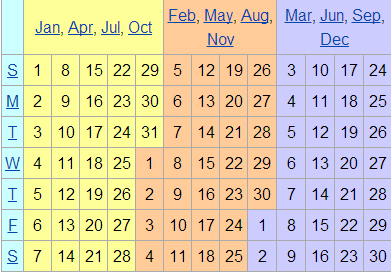 If additionally, weekends fall just right, there might only be 19 working days in May. This is especially sad, because most of Germany does not have any public holidays between May or June and the beginning of October, crating a huge holiday-gap after the Spring holiday-boom. Post-Gregorian Calendar: this one's really neat, because it is just a tiny change to our existing calendar which makes a big difference with it's repercussions. 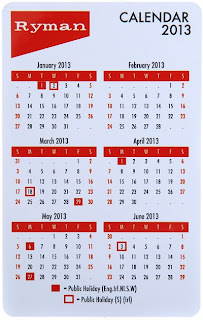 This calendar simply makes the first day of every year (1st January) a Sunday by definition. Applying all the normal rules will mean that the last day of the year (31st December) will also be a Sunday. Thus, the major change is simply to have one Sunday be followed by another Sunday. Of course, this would be unacceptable to fundamental Christians, but it would be very practical, since 1st January is a public holiday in most countries anyway, which is practically quite similar to a Sunday. So 31st December would be a normal Sunday (because the day before was a Saturday) and then the 1st January would be a public holiday, where people don't work, so we can make it a Sunday as well. This simple change fixes all the dates of all the non-leap years each to its specific day-of-week. As for the leap years, we have to apply one more trick to make them perennial, too, and this trick will be very plain: in non-leap years, 28th February is always a Tuesday and thus 1st March is a Wednesday and we simply keep it that way for the leap-years, too: 29th February becomes a public holiday which you can call an additional Tuesday or a pre-Wednesday or a Middle-of-Week-Sunday or simply "The Leap Day". This might seem quite revolting to conservative people, but it is not much more revolt as having a "double hour" every time we switch back from daylight saving time or having a "date boundary" in the Pacific where on one side it's always one day later than on the other side. If you think about this more, then the point of the Post-Gregorian calendar is not having an extra day in one or two weeks a year (because all perennial calendars need to have something like that), but the Post-Gregorian's specialty is to put those extra days in places where they least disturb ordinary, conservative life. The World Calendar. This one's actually been promoted for real and even been discussed at the United Nations. First published by the American Elisabeth Achelis it is one of many proposals that came up after the 18th and 19th centuries when the French Revolutionary calendar was actually made the official calendar of a powerful and modern state. But back to the World Calendar, which is so simple and beautiful that you must love it. It inserts an out-of-week day at the end of every year as well as between the second and third quarters (that is, between 30th June and 1st July) on all the leap years. Unlike previous calendar reforms, the World Calendar keeps the names for the twelve months and simply makes the months 31, 30, and 30 days long in each quarter. In recognizing quarter-years as important periods for modern-day business it departs from previous proposals which were more focused on the seasons and agriculture. There are other Calendars which I also like a lot, especially when they come up with more meaningful names for the months and with more meaningful and less dogmatic public holidays, but I will leave this topic to another post. 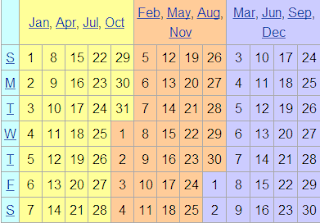 To conclude, I only want to mention one type of perennial calendar which I distinctly don't like and that's any calendar which uses leap weeks instead of leap days. Leap weeks were introduced so that the religious seven-day cycle is never broken, hoping that dogmatically religious people will then accept calendar reform. But I think this line of thought will just not work because many conservative people will just not accept any reform and compromising to them will makes matters only more and more and ever more complicated. For example, both calendars described above (as well as almost all other leap-day calendars) keep the same leap-year rules as the Gregorian calendar and will thus start every year on the same day as the corresponding Gregorian year. This is a very useful feature which all the leap-week calendars give up. Besides, to end on a rather subjective note, I just think an entire week popping up between the years is quite unaesthetic and not as nice as having a single public holiday every now and then. It is just about one year now since I started to meditate regularly. My introduction and principal guide to the subject has been the Book Search Inside Yourself and it is also the intro book which I would most recommend to anybody curious about the subject. After the first couple of months I stopped using my mantra and just meditated by concentrating on my breath or by "observing my thoughts" (a technique I learned from a fellow meditator in Berlin). Observing thoughts is very interesting, but it is also an invitation to get carried away by one's thoughts, so it's very important to notice this and go back to more basic forms of meditation where I just concentrate on breath and practice my focus on this. Although I didn't use the mantra any more, it was still my motto and my main intention for meditation. That's why now, after one year of progress, I decided to focus on a new intention. But before telling you about it, I want to share some of the good outcomes I enjoyed. The answer to this is that meditation gives me a better self-awareness which means a much better knowledge of what exactly makes me feel good or feel bad. There's a whole science of "Miswanting" now (term coined by psychologist Daniel Gilbert, here's a paper about it, if you like to read science) and I think that meditation really helps to figure that stuff out. For one example, I don't like grocery shopping a lot and I often procrastinated doing it and tried to compensate by combining it with the pleasant activity of a bicycle tour, buying my groceries on the way back home. But as it turned out, this was a bad strategy: my biorhythm seems to prefer spending most of the day inside (reading, doing housework, cooking, and writing blog articles such as this one) and then go biking rather late in the evening, often coming back in the dark. Combining shopping with biking would mean that I can't bike at my preferred time (because shops will be closed on the way back and I don't want to shop on the way out and carry all my groceries through the summer heat for hours) and it also means that I can't go far away from the city, because I have to plan the route such that a store is on the way back. In the past, all those complications just demotivated me to go out at all and I didn't really know why. Now I know and I combine grocery shopping with other activities, such as grabbing a quick lunch outside. And for biking, I now more often invest some time on a train to go a little farther away from the city. Or I head directly towards the shortest and nicest way out of the city. To conclude, I think that I am now somewhat more calm and definitely more positive and happy! Choosing my next meditation goal was very easy, because there are two other basic skills or attributes mentioned in the book, which seemed to be particularly lacking in my life. Therefore I decided to work during the next six months to improve my concentration and my resilience. But more on that in another post.